Can one be a tool to transform another? There is an old adage: “The pathway to God is strewn with stones and thorns.” History is replete with men and women having undergone enormous suffering on their way to sainthood. They were vilified and martyred by those intoxicated with worldly power. But, today, by the grace of our Living and Loving Lord, Bhagavan Sri Sathya Sai Baba, a devotee would be spared such a treacherous path. Of course, we would encounter our share of karmic problems, but with Swami’s mercy and guidance their impact upon us would be minimal, because Swami enables us to witness these events from a higher plane of awareness. Two millennia ago there were two men with the same initials: J.C. One used his army to conquer more land for his kingdom on earth; the other used the power of his love to secure the kingdom of heaven. They are Julius Caesar and Jesus Christ respectively. We remember only the latter this day and worship him. He showed humanity the way to the Eternal Kingdom. One cannot reach the summit without transformation into the Pure-Self again, from where it all began. Many devotees do face innumerable difficulties and suffer significant losses. People often ask why spiritual aspirants should encounter such problems, while those in worldly pursuits seem to be happily living without such hardships! Those of us who have been attracted by Bhagavan not only have experienced His boundless love but also had many of our worldly desires fulfilled. We have floated in this new-found joy and prayed for even more worldly dreams to be fulfilled, committing ourselves to spend our spare time in various ‘Sai-activities.’ In the beginning we could hardly stop talking about our experiences with Swami and all our achievements. In the next stage we started publicising our achievements, forgetting Who the Real Doer was! In the third stage we encountered several problems and our ego, pride and possessiveness was brought down to the ground. We backed-off in silence consequent to humiliations, conflicts and various kinds of losses. The late Prof. Kasturi calls these three stages: Chatter-ji, Banner-ji and Mukher-ji!By His grace alone our faith in Swami remains intact and we persevere with our sadhana of introspection. We pass through our ‘spiritual winter’ with patience and wait for the spiritual springtime to dawn and to rejoice seeing the blossoms of higher values and virtues. By this unique way Swami fulfils the great task He has taken advent for: transformation of the human to the divine. In this article, the writer is attempting convey some complex but subtle ideas, based on his personal experiences with Bhagavan for almost three decades, with the hope that the readers would read this contribution in the proper context, and lay themselves in the hands of the Divine Master. The Universe originated from God and is the manifestation of God. Divinity pervades everything in creation. The essence in every person is Divine. No wonder our Beloved Swami addresses us all as Bangaaroo (gold). Just as the jeweller removes all impurities from ‘raw gold’ before making an ornament, the Avatar, in His inimitable way, removes our animal-nature (vasanas) and transforms us into Divine beings. We may attempt to explore this mystery basing it on our own experiences, the learning curves we go through, and the trials and tribulations we encounter. Of all the 8.4 million species of life-forms on earth, human birth is the most precious. Life on this planet has been evolving over five billions years, beginning with minerals, plants, the animals and finally the human. Life in the human form emerged some 900,000 years ago, through 55,000 generations, to reach this point in time of earthly evolution. Of the six and half billion people on this planet only a few aspire to explore and experience their true nature, both from the physical and spiritual perspectives. Amongst them are those extremely fortunate ones who have come face-to-face with God. We have the All-inclusive and Causal Phenomenon, the source of all creation in the Human Form in our midst. 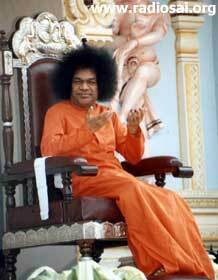 Bhagawan Baba’s advent is for the spiritual uplift of the entire humanity and to hasten the awakening of their inherent Divinity. The universe has manifested from the formless primeval Energy, which is Consciousness or Brahman itself. From this Pure Energy, the primordial source of creation, the five elements – ether, air, fire, water and earth - manifested first, giving a form to the created. Evolution began with the mineral kingdom which was unaware of it own consciousness. With each upward step in evolution, through the plant and animal kingdoms, this awareness kept expanding until it reached its zenith in the human being. Humanity has reached the threshold of the final breakthrough to experience the Self within and live in full awareness. Being seen as the crown of nature, evolution has achieved an ‘organ’ that has ‘Self-consciousness’ and can think into the living Universe and commune with Higher Intelligence. That is, the human alone can experience oneness with the infinite source and lose any feeling of separateness from the entire creation. Birds and beasts are completely under the control of the mind, whereas a human being is capable of bringing the mind under his/her control. Animals by and large live by instinct on the physical plane. They do not think or worry like human beings. Their energy and vitality is governed by other modalities, more at the bio-physical plane. Most animals react in a mirror-like fashion on account of their primitive mind. A dog will bark in return seeing another dog bark or wag its tail in response to another likewise. Unlike animals the human mind is more evolved and can think and discriminate. Hence, when man reacts like an animal he falls short of being a human. Thought itself is energy and generates its own vibes. The vitality and energy of a person is a reflection of the state of their mind. Pure, loving and inclusive thoughts generate positive energy that vibrate at higher frequencies, while negative energy permeates selfish and exclusive thoughts, which vibrate at lower frequencies and drain one’s own energy. These vibrations are so subtle that they are perceived unconsciously even by the lower species, let alone fellow humans. There are seven chakras or centres of energy in the human. The lower three chakras vibrate at lower frequencies and the upper three chakras vibrate at higher frequencies, the heart chakra being the central divide. Only when bestial qualities are shed one begins to manifest divine qualities. Energy levels soar high and vibrate through higher chakras. This energy or vibration is at the quantum level in every cell and not limited to any organ, not even the spinal cord, which is merely a channel. Only by feeling the Oneness with the entire creation can one experience divinity. 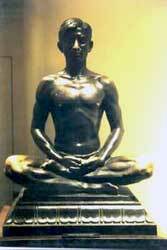 But bestial qualities that have been carried forward from the past (vasanas) preclude us from such an experience. These have to be shed. Until then these characteristics will keep showing up in many circumstances. One has to be exposed to a wide range of experiences that will stir up these bad qualities for elimination. The human alone, endowed with the intellect, is able to discriminate and dispatch such animal qualities as they surface. By saying “… remove vasanas and desires in him that would turn him into an animal or an insect …” we have to understand that Swami does not mean regression of a human into an animal or an insect in a future incarnation. He is merely referring to the recurrence or persistence of the qualities of animals and insects in human behaviour and consequently having to encounter being treated the way animals and insects are treated, and suffer the consequences. Without devotion, discipline and determination one cannot achieve this. The intellect derives its strength from the Atma, which is in its close proximity. We are given opportunities several times, even over several incarnations, to decimate these qualities and move upwards. Although nature is the preacher and our life is the teacher, we fail to learn our lessons from nature on account of our arrogance and superiority. Instead of being good stewards of nature, deluded by our belief that humans are ultimate masters, we exploit nature, as if it was there for our pleasure. On account of their ego and selfishness some even take advantage of the weaker ones in society and subjugate them in many ways. The law of nature is divine and shows no partiality. Every action causes a reaction, reflection and a resound. That explains how and why nature hits back when we exploit it and causes great damage. Individuals and nations also continue to feud because of selfishness, not realising that they are hurting only themselves. When will this all end? If we continue to destroy nature it will hit back even more furiously – tidal waves, earthquakes, raging bush fires, floods, droughts, soil degradation, climate change, ozone holes and many more. We cannot continue to remain unaware and keep ignoring the malfeasant power of the mind, which Swami refers to as the demonic mind. Individually and collectively we are creating calamities around us and all over the world. Conflicts and wars have their origins in the human mind. Even vain gossip and slander can cause great distress. When we look closely at the so-called modern civilisation, modern education, material prosperity and the unrestrained media for profit and sensation, it is quite evident that human beings today are selfish and showing more of the animal qualities. Animals have their fair share of fights in the jungle, where herds of animals battle against each other to carve out a territory for themselves. Yes, we have to concede that we humans too show such qualities at times, provoked or unprovoked. Remembering that the divine is in everyone we must be steadfast in avoiding such evil thoughts and deeds. Swami’s benign advice to us is to remind ourselves that we are human beings and not animals. Dominated by ego and selfishness, the recurring animal behaviour would be hard to eradicate. But we have to be earnest in our sadhana and Swami’s grace will flow in abundance. “There is no unity, purity or divinity,” Swami says. This should be the hallmark of every human being practising the five Human Values. We are desecrating ourselves and destroying nature ever more. Our travesty of natural values has reached a critical point when God Himself has descended upon the earth to intercede and salvage the situation. Bhagavan Baba is doing just that, to transform the ‘animal-man’ to ‘God-man’. His ways are inexplicable, unique and subtle. Swami says, “Nature is the best preacher and your own life is your teacher.” Nature is also the manifestation of divine energy and consciousness, but we continue to remain ignorant and too egotistic to learn from nature. Providence gives unique opportunities for us to learn from our own mistakes, in our relationship with family, friends and associates. Sometimes one has to face even harder lessons to eliminate such animal qualities and transform. When karmas are inextricably linked between individuals as well as in life situations, one has no option but to endure these difficulties and ask, “What is that in me that has attracted all this?” God alone knows what is best for each one of us. He will send the right kind of people as instruments to chisel out some of our undesirable qualities. In some of His discourses Swami has compared our behaviour to those of animals – dogs, cats, rats, pigs, donkeys, monkeys, snakes, etc. Swami has even commented that animals have a reason and season, but man has no reason or season. For those earnest on the spiritual path, Bhagavan gives His devotees more opportunities to transform. Just as doctors prescribe different medications to patients suffering from different diseases and keeping an eye on their progress, our ‘Divine Doctor’ may place us in tailor-made life situations for us to learn valuable lessons and endure certain difficulties. Wisely we should learn to resolve conflicts within ourselves and with others, without any bitterness or enmity. Such testing times may arise both in our private and public life. The conflict within us is a battle against our own conscience, which would be the ultimate winner on the spiritual path. Inter-personal conflicts are due to ego, selfishness and domineering nature, and this can be overcome only by fraternal love and forbearance. Decades ago Bhagavan Baba had cautioned His devotees that they have to overcome many hardships. With the right perception we would realise that such hardships and conflicts do have the power to exorcise some of our negative traits. With Bhagavan’s grace conflicts do not go out of control within His fold; they neither cause material hardship nor collateral damage. The suffering is only mental, which will vanish with proper spiritual training of the mind. One would never, even in the wildest dream, contemplate a lawsuit against another, especially a fellow devotee, as we often see elsewhere. Instead, we would develop a deeper understanding of the matter and accept that the setback was for a higher purpose. With greater determination, discrimination and love, all our attachments and enmities melt away into peace and forbearance. A few years ago, in one of the Trayee sessions, Swami told those gathered around Him that they should make every effort to clear up all enmities and blessed them. Otherwise these haunting feelings would get carried into future births, He cautioned! His universal presence and loving guidance is always there in whatever task a devotee undertakes, remembering His Divine Name. The following metaphor would illustrate how an individual could transform another individual. Imagine, finding a gold nugget by chance while digging the ground. Let us place the nugget alongside a beautifully handcrafted necklace in a locked showcase. The nugget is now in the company of the necklace, which itself was once a raw nugget. Would this gold nugget change by itself merely by its proximity (satsang) with the necklace? No, because it has not gone through the tools of transformation in the hands of the jeweller - fire, anvil, hammer, tweezers, cutters, polishers, etc. He has to use these tools to work on the nugget to transform it into a beautiful ornament. What are these tools made of? Neither plastic nor wood; but another metal like steel, dark and ugly looking compared to the brilliance of gold. 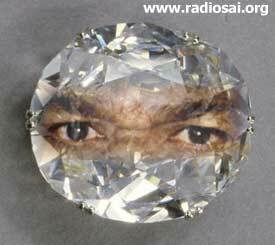 Only a metal can transform another metal, we infer, just as a diamond alone can cut another diamond. The same applies to humans too, where only a human would prove to be an effective tool to transform another! Many aren’t aware of their own inner blemishes, but readily see faults in others. 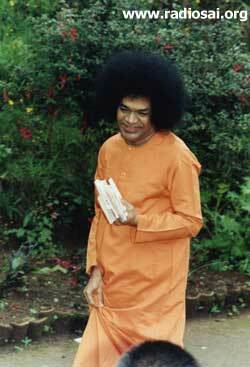 Even if we are unaware of our hidden traits, Swami can clearly see them all, being the God-in-every-human. We cannot conceal anything from Him because Bhagavan is the indweller in everyone. In His infinite mercy and compassion He is ever forgiving and patiently guiding those who have taken their first step towards Him. Jesus said: ‘When you see a mote in another’s eyes you fail to see a beam sticking across your own.” Bhagavan Baba reiterates this by saying, “When you point a finger at another, three fingers point at you.” We find fault in another person only because the same blemish lies hidden within us. How come, not everybody can see that fault? They cannot see it because they do not have the same fault in them. They are like innocent children, so pure! We may compare this to two computers with ‘matching’ files. Hence, when we see a particular behaviour or fault in another, it simply means such a defect is within us as well! But the power of delusion and ego will not entertain such a thought. The sooner we learn to accept and abide by this truth the greater will be our gain. This will give us the strength to eliminate our negative qualities as they surface. Swami has told the writer a few times that there is nothing bad whatsoever in His entire creation. Even what we consider as bad in the present may not be bad after all on hindsight! “If you have a thorn in your foot hurting you, you will need another thorn to dig it out. Then, you can throw away both the thorns and be free of pain,” says Swami. Only a ‘minus’ can interact with another minus to make it ‘plus’. No amount of ‘plus’ can make the ‘minus’ become a ‘plus’. So also, when we enter into a relationship with other individuals with similar negative traits the divine alchemist begins His work stealthily to eliminate these blemishes in both - of course not without pain and anguish to begin with. Such experiences are painful to one’s ego only. Individuals in whom we see faults are merely reminding us that the same fault is also in us. We have to seize upon every opportunity to weed out our own faults, just as a thorn is useful to remove the one embedded in our foot. This mechanism is also comparable to active immunisation, where a controlled dose of the same germ that causes a particular infectious disease is given as vaccine. Rigors, fever and pain will ensue, but immunity gained would ward off a potentially lethal infection later. God too comes in the human form as Avatar to transform humanity and lead them towards God realisation. Swami Himself has said that if He had come as a ferocious lion, we would have caged Him; as a benign inimitable form with many heads and limbs we would have exhibited this unique ‘creature’ and collected money. If we envisage Him manifesting as a scary lightning and thunder, hurricane or earthquake, we would rush into our bunkers for safety. So, God also has to descend in the human form to befriend us and lovingly guide and transform us into true human beings and make us realise that we too are divine. 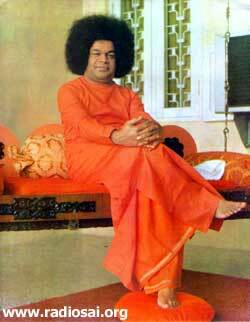 Bhagavan, by His infinite love, glory and compassion, has attracted millions of people from all corners of the world, irrespective of caste, creed or social status into His fold, not to mention His countless miracles, which Swami refers to as His calling cards. His power of attraction is called ‘Chamatkar’. Once in, the ‘operation-transformation’ begins, tailor-made to suit each individual. 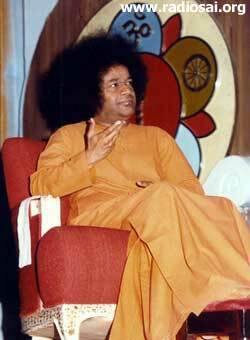 This stage of refinement is called ‘samskar’ – that is to transform the ‘animal-man’ into a ‘God-man.’ Our Omniscient and merciful Bhagavan places His devotees, striving to realise the highest truth, in such situations in life that are perfect to hasten their spiritual growth. Life becomes a melting pot where undesirable qualities get distilled away! The ‘animal-man’ has great limitations, most importantly because of the identification with the body. Mirrored by the mind, one thinks of oneself as the body. We can only see a very small facet of our totality, which is like an iceberg, but we are unable to see the enormity of our subconscious mind (‘mindberg’) with all its trappings, negativities and animal tendencies that manifest as lust, anger, greed, possessiveness, pride in outer strength (ego), envy and jealousies! They cannot be destroyed by worldly means, but can only be annihilated through spiritual practise. Only through personal experience and self-inquiry can one engage in any meaningful and soul-searching transformation. Just as a fruit ripens at the right time in the warmth of sunlight, we too would grow in spiritual stature with the loving grace of our Beloved Swami and reach the third stage of expanded Love, Paraopakar, and finally God-Realisation, Shaksatkar. Bhagavan has often reminded us that He is fully aware of our past as well as our future. His ways are inscrutable and He has the power to transform any human being into a good and Godly person. He is the source of the Universal and Infinite Energy of Love. Bhagavan is LOVE. His Love has no bounds and is not only the greatest of all healers but also transmutes each and every person who has come within His orbit.